FOLLY: We’re continuing the healthy series today also known as Folly is working from the Island so order from all the place that don’t cross the bridge. This is one place I’d been really dying to order from based of their Instagram. I’m so glad that we finally did because, spoiler alert, The Healthy Kitchen did not disappoint. FOLLY: Ordering was simple enough, I called in stated my order and my delivery address. I specified the time I wanted my order to arrive and it was delivered with 9 minutes of said time. I call that timely and also impressive. NOSA: My order came in very “on time”. Asked it to be delivered at 2pm and it got to me 15 minutes early. Warm too. I get the feeling that their kitchen is not too far from my office. FOLLY: I was quite excited by the menu and I wanted a fuller experience so I ordered an appetizer (Parmesano Mushroom Bites) as well as a main (Warm Red Cabbage Salad). NOSA: Ordered the Chicken Avocado Tortilla Wrap with sweet potato fries as my side. The sweet potatoes were tasted delicious in ways that the adjective doesn’t do it enough justice. NOSA: Now that I read the description on the website, I don’t think I can recall tasting any onions or peppers or tomatoes. No wonder it tasted so “healthy”. The avocado spread was so overwhelming. You can tell from the pictures too. It’s literally popping out fo the tortilla wrap. FOLLY: The mushroom bites were glorious and the exact kind of thing Nosa would like. As I ate them, I felt a little bit bad that Nosa didn’t get to experience them too. The stuffing in the mushrooms were stuffed with onions, green pepper, and a blend of hard salty cheeses i.e. the best! NOSA: Yeah, I’m a bit jealous of those. Might order those some other time. NOSA: About my tortilla wrap, I didn’t think there was any difference, taste wise, between a gluten free tortilla and a regular wheat tortilla. I was wrong as hell, boy! When I ordered the wrap, I thought I’d feel some guilt while eating it because of the tortilla. Nope. Felt no such thing. The tortillas had this weird texture that I can’t quite explain with words. Almost dry or “dusty”. If you ever order it, it’ll all make sense. NOSA: Speaking of guilt while eating, since cleaning up my diet a bit, I feel so terrible when I fall off the wagon. Just looking at myself all disgusted like, “why did I have to eat all that?”. This is why finding The Health Kitchen feels like the Lord sending me a message. They have zoodles and gluten free pizza on their menu. It’s like striking paleo gold. FOLLY: I picked this salad because red cabbage and rocket are my preferred salad bases but this was such a monochrome salad that I tapped out halfway through. 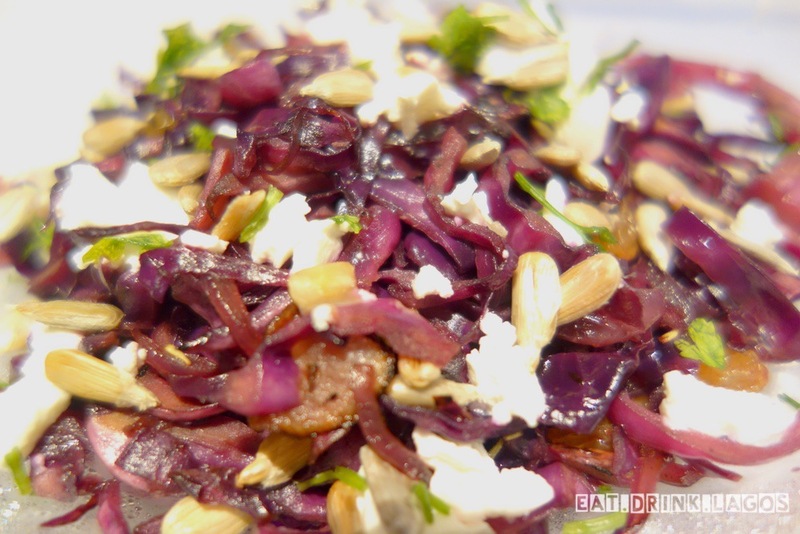 In addition to the red cabbage, the salad had raisin, sunflower seeds and feta. The raisins contributed a consistent general sweetness to the salad and the dispersed sunflower seeds, thankfully broke that up every time I got one in a bite. The feta was also great while it lasted - I think the limited amount of that also contributed to me tapping out a bit earlier than planned. NOSA: Like The Healthy Salad Company, The Health Kitchen is also on the pricey side. Why does healthy food have to be so expensive? For the same outlay, I can stuff myself with shawarma. It’s definitely worth it, but its hard to rationalize the spend if it’s a daily thing. They really do need to get a physical space though. I know it’s not as easy as just saying it, but the menu definitely deserves sit down treatment. FOLLY: Loved! I will definitely order again. The Health Kitchen has such an exciting and streamlined menu. EDL Weekender: Sylvia Hits Cinemas Today!